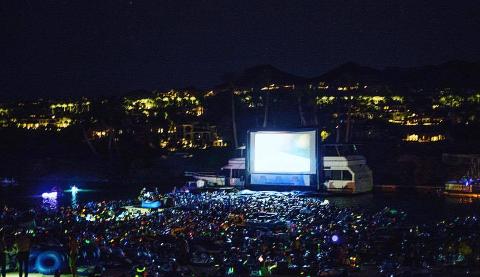 Last year we made history with showing Jaws On The Water with hosting 1600 people! This year we are looking to do it again by showing Jaws 1, 2, and 3!. 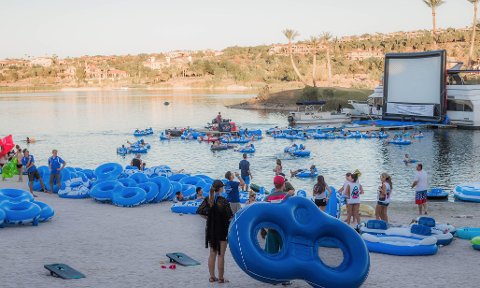 Grab your friends, put on your best Jaws costume, and get ready to make history at Lake Las Vegas! NO OUTSIDE FOOD OR BEVERAGE WILL BE ALLOWED TO THE EVENT! FOOD AND BEVERAGES WILL BE AVAILABLE FOR PURCHASE WHEN YOU ARRIVE. The movie will begin around 7:00-7:30, check-in will open at 5:00 PM. We will have a live DJ playing music prior to the movie. Drinks and food will be available for purchase. No outside food or beverages will be allowed. Please arrive at least 1 hour prior to movie start due to the possibility of long lines. If you are bringing your own tube, it must be a maximum of a 2 person tube. There will be storage facilities available for $10 for personal belongings. 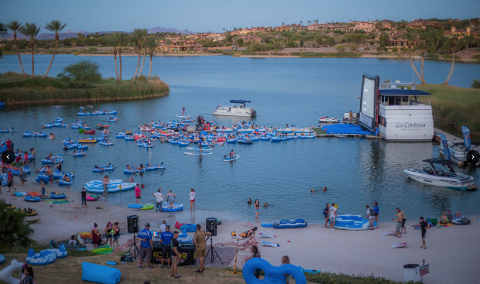 The storage will close 1 hour after the movie, and all leftover belongings can be collected the following day at our main store located at 20 Costa di Lago #130, Henderson NV 89011.